Hermes | Learn about Greek Mythology,Greek gods,Greek mythology stories! 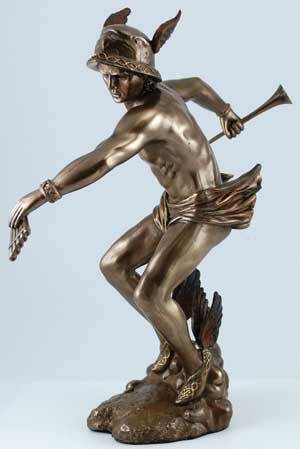 In Greek mythology Hermes is the messenger of the gods . Even works as a psychopomp, ie leads the souls of the dead to Hades (as we learn in the Odyssey), but he is also patron of thieves, gambling and trade. According to the prevailing myth, the father of Hermes was Zeus and his mother Maia, one of the Pleiades, the daughters of Atlas, the giant who held on his backs the sky. This is the Pleiades daughters whom later Zeus turned into a constellation, along with the hunter Orion, as he was pursuing them. He is perhaps the most sympathetic deity of Greek twelve, combining very strong human and divine elements, but also because he is essentially the first teacher of the human race, He introduced letters and sciences to humanity taught using intellect and indeed there are myths which attribute to him imparting knowledge of fire to humans. Simultaneously he is a patron of commerce, sacrificial rites and magic. "... Hermes is the most likeable, the most unstable, the most confused the most complex and therefore more Greek than all the Olympian gods." Ηowever,his main features,are that he works as a messenger of the gods, ie as an intermediary between them and the people, and fulfills the proffesion of psychopomp, leading the souls of the dead to Hades.He is also one of the deities which for his activities uses the dark nights and for that he is considered to have very good relationship with the Moon. Even mentioned that at the night that he stole the sacred cattle of Apollo, only the fourth day of his birth, the Moon came out twice to ease him in moving from Pieria to the mountains of Kyllinis. His symbols are the caduceus, emblem Swift messengers, and winged sandals. In the Internal Tradition Hermes symbolizes the "Logos", ie the set of all minds in the universe or to any of the subsystems. The origin of Hermes is very distant and is associated with the prehistoric Greece, as there is evidence suggesting that the Herms, (; upraised stones used to define areas and also as signposts for travelers) they were widespread in prehistoric Crete and in other regions of ancient Greece, and is deemed to have a close relationship with Kaveiria mysteries, most primordial mysteries of Greek territory in ancient times. As is known from the Ptolemaic period, the city of Alexandria in Egypt is one of the most famous spiritual center of the era which meet and mix all the philosophical currents. Than before, however, since the Greeks came into contact with the Egyptian culture and religion, came an identification of the Greek Hermes and Egyptian Thoth, and found that there were common features between the two deities. However, during the Ptolemaic and Roman period and the early centuries AD was a new archetypal form, which was not exactly either Hermes or Thoth, but a combination of characteristics of both seasoned and probably influenced by the Jewish tradition . The 2nd century BC the Jew Artapanos novelist wrote a narrative of the life of Moses, which identifies the hero with Hermes, ie Thoth, considering that he imported to the Egyptians, ships, machines, guns, philosophy etc.. Considers him also inventor of hieroglyphs. More generally, Hermes in the Hellenistic period was a carefully constructed cosmopolitan deity, which could be identified perfectly with mortal ones. For example, Lycaon had no difficulty recognizing in the face of the Apostle Paul incarnate Hermes, because he was a skilful speaker. This is because due to the status of Hermes-Thoth as messengers of the gods established the Hellenistic Hermes as "Logos", meaning those people who interpret the divine will.